This is one of my favorite dishes when I go out for Thai food. Of course, the challenge is finding a place that doesn’t use soy sauce (or uses gluten-free soy sauce). 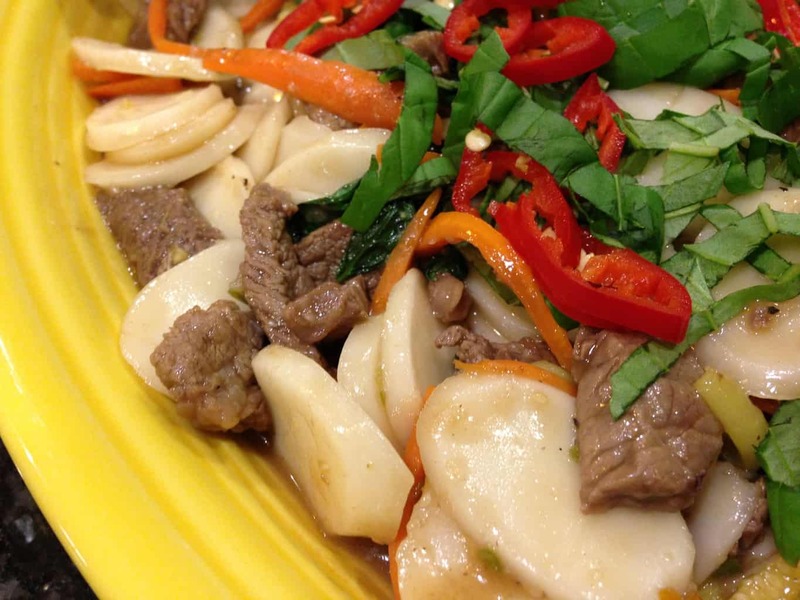 And sometimes rice noodles have a bit of wheat flour integrated or dusted on the noodles. Meaning, sigh, that I haven’t actually found a place that makes this dish gluten-free. Have I let that stop me? Of course not. This is a fast dish to put together (and can be made with chicken or shrimp if you prefer). You can prep all the ingredients while the noodles are “cooking”. The rest is a quick saute in your wok or skillet. While this dish is traditionally prepared using fresh rice noodles, I’m having a hard time finding them without wheat flour. So I’ve substituted Korean rice cakes (also known as dduk). Rice cakes are actually thick rice noodles; they have a chewy texture and work well with all kinds of flavors. You can purchase them as a long cylinder or already sliced. I’ve also seen them in a gnocchi-like configuration. They keep well in the freezer, so I buy several packages when I’m out shopping. Find them in the freezer or refrigerator sections of Asian grocery stores. The best thing about this dish? It can be spicy or mild, depending on your mood. Also, it makes fantastic leftovers. Years ago during South by Southwest, my husband and I snuck out for a meal by ourselves. We ended up at the Moonshine Grill in downtown Austin. On the menu was an amazing macaroni and cheese with spicy green peppers. The moment we returned home, I started trying to recreate this recipe. Over time, I stopped trying to make Moonshine’s mac and cheese, focusing instead on making my own. My ever-faithful bookclub has cheerfully (and hungrily) endured my experiments over the years, and there was only one major failure. Note to all: soymilk is not a good substitute for real milk in this instance. From my perspective, the key to good mac and cheese is a mix of cheeses that bring appropriate meltiness and flavor. As a rule, I rely upon good old-fashioned regular milk when making my cheese sauce, but have, once or twice, tried out evaporated milk. The latter does add an interesting creaminess to the sauce…and that weird evaporated milk smell completely disappears in the sauce. Needless to say, this recipe makes excellent leftovers. I do find that gluten-free pastas tend to absorb a lot of sauce, so I tend to go heavy on the sauce, lighter on the noodles. I’m not a huge tomato sauce person, but lasagna is one of my weaknesses. How could I resist? Gooey cheese, layers of meat and noodles, that sauce pulling the whole thing together. And because I couldn’t find gluten-free lasagna noodles ahead of time, I bought 12 boxes from Amazon. That’s a whole lotta lasagna. It takes about five minutes of Internet research to discover that everyone has a favorite lasagna recipe, ranging from quick to laborious. Or, there is no wrong way to make a lasagna. Take what works for you and don’t worry too much about doing it “right” — as long as it’s tasty, you’re good. This recipe involves making your own Bolognese sauce, so it will take some time (think of a terrific sauce simmering on the stove all afternoon, that’s what we’re doing here). Letting the sauce simmer develops a rich flavor — one I find hard to replicate with store-bought sauces (which, of course, I use when time is working against me). As you will see in the notes, you can skip steps 1 − 6 if you are pressed for time. * — Okay, truth: those noodles will be gone in no time since I’m testing different lasagna styles. It should be obvious by now that I love meals that result in lots of yummy leftovers. Lasagna fits that need perfectly. It’s such a flexible dish — there are so many ways to make it, it can be made ahead of time and popped in the oven later, and it’s a great dish for those nights when it’s your turn to host your book club. Because my local grocery stores don’t carry gluten-free lasagna noodles, I bought a case from Amazon.com. The price was fantastic, and knowing I have the noodles handy opens up a wide range of of possibilities…including lasagna roll-ups and cupcakes! Once you have your favorite base recipe, it’s easy to try different serving ideas. 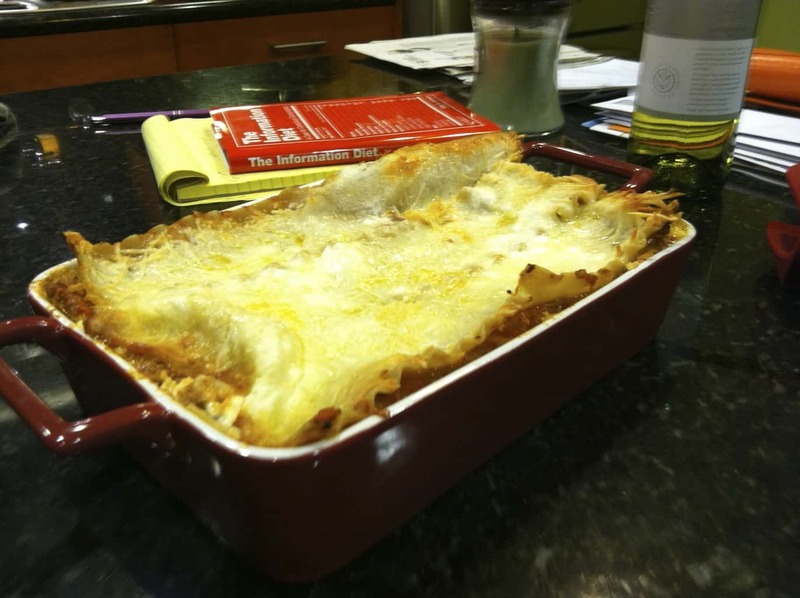 I know that most people think of red meat sauce and loads of cheese when they think lasagna (I know I do), but this recipe takes the dish in a whole different direction. You can continue with the Italian flavor profile, mix in a little Mexican or Southwest American, or go wild with Caribbean spices. Whatever tickles your palate.